We service the entire New Jersey area. 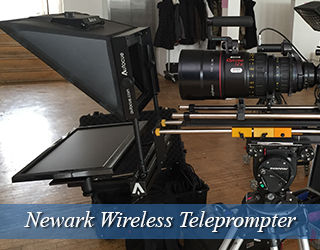 This through-the-lens unit is the most common type of prompter on video production sets. It allows the talent to look into the camera while reading copy. 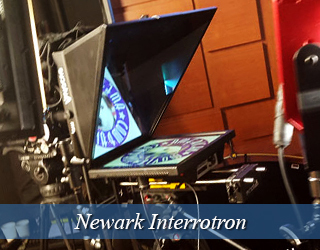 The Interrotron Mark III ($945) is made up of a unit for the director (camera, lens, tripod, professional monitor, hood, mirror, mounting plate) and a unit for the talent (professional monitor, hood, sliding 15mm double gold plate mounting system). The units together make it possible for the director to have a conversation with the talent as if they were face to face, while the talent looks directly into the camera. This is ideal for creating a more natural feel for the talent on camera. The interrotron gives the talent someone to be talking to, which takes away the intimidation and discomfort that looking directly into a lens for extended periods of time can produce. 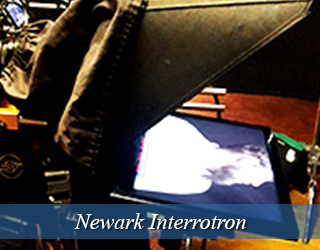 The Interrotron Mark II ($845) includes the talent unit, along with a camera and lens. The talent will be able to see the director, however, the director will not be able to see the talent and must look into the camera that gives the image of the director to the talent. 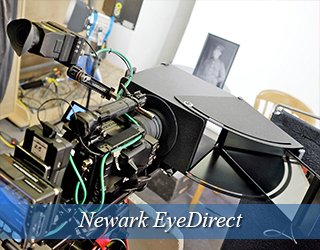 Like the Interrotron Mark III, the EyeDirect provides the talent and director the capability to see each other, while still giving the effect that the talent is looking into the lens. This unit is recommended only for stationary camera setups. This unit is available for pickup in our New York office or for shipping via FedEx. 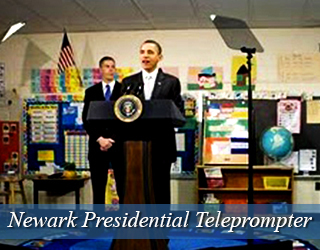 The Presidential Teleprompter is made up of two glass panels, set up on both sides of a lectern. The speaker looks at the panels to see a script or text, but the audience can only see the glass, making it look like the glass has no text on it, so as not to block their view. This unit is often used at conferences, award shows, graduations, presidential speeches (hence the name). The operator should be let into the venue a few hours before the event starts so that they can adjust the position of the prompter and the script font to the comfort of the talent. The Rise and Fall Robotic Presidential Teleprompter is another unit we can provide. 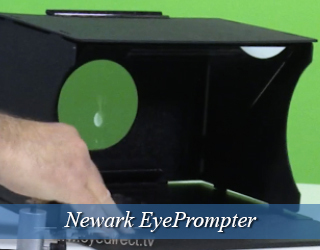 For live events with more than one speaker using a prompter, this is especially useful. The ideal height of a presidential stand is different for everyone, and needing someone to run onstage to fix the height of the prompters between speakers not only looks bad but also opens the risk of the glass breaking. 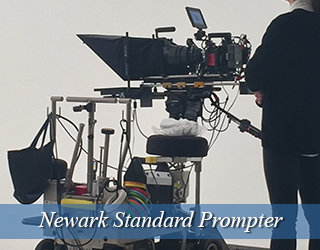 With the Robotic Prompter, the height of each panel can be adjusted remotely by the operator, allowing for a smooth transition between those speaking. 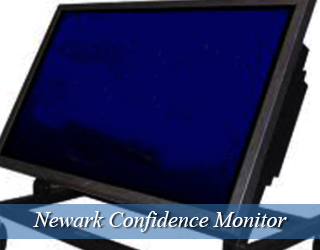 Confidence Monitors, like Presidential Prompters, are generally used for public speaking and stage events, except with this unit performers can walk around the stage while still having access to the script or lyrics. Musicians commonly have a few monitors placed around the edge of the stage at an angle so that they are out of the audience’s view. We have a variety of monitor options available. Call Bill Milling at 917.414.5489 or Jocelyn at 646-617-6535 to discuss your event. The iPad Teleprompter only takes a few minutes to set up and fits into a laptop case, making it a perfect unit for small shoots with limited prep time, small budgets, and shoots that require travel. The iPad unit can be placed on a low light stand or C-Stand (typical 750 stud) is not included. If you want a completely invisible Teleprompter then the Podium Prompter is the perfect match for your needs. 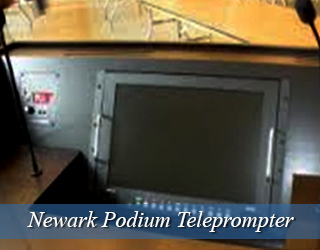 The Podium Prompter is a small screen located on the top of the podium. 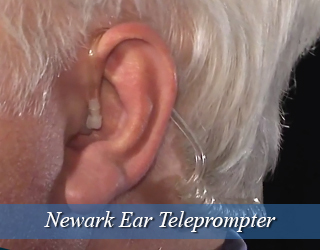 This Teleprompter helps the speaker give a natural speech as if he/she were just glancing down at notes. Newark is the second largest city in New Jersey, and the second-most diverse (after Jersey City). It is home to many corporate headquarters including Audible, Prudential and PSEG. It is also home to the campuses of Rutger’s University, NJIT and Seton Hall University’s Law School. The city has also played as a backdrop to several films including The Dark Knight Rises, United 93, Annie, and War of the Worlds. Given its proximity to Manhattan, we often lend our services to companies here. Susana is happy to have a recurring gig at the Prudential Center. She speaks several languages, including Portuguese so she feels right at home. She also loves the many Portuguese, Spanish restaurants in the area. 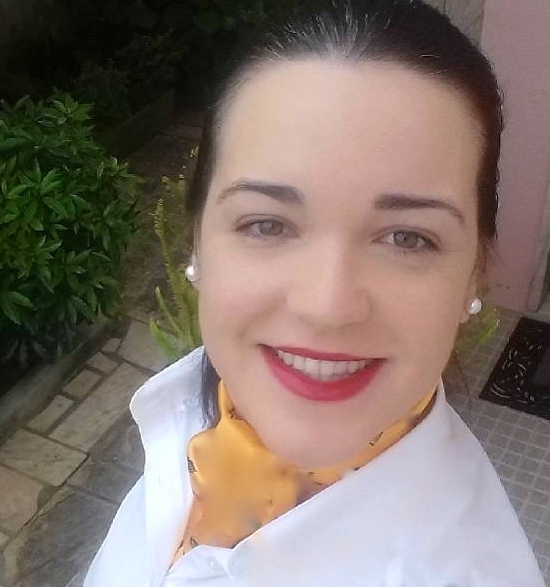 Susana raves about a particular custard thingy – pastel de nata. She brought some to the office and they were gobbled up in seconds! I digress, her talent is awesome. She puts clients at ease and works closely with them – their delivery is enhanced by her attention to enunciation and relaxing techniques in front of the camera. At the end of October, she’s going to Princeton for two weeks – working with a major company and its staff. Contact us at 917-414-5489 for further information about speech coaching in the Newark area! 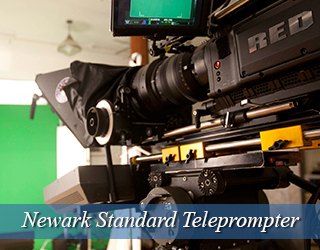 This particular service is in demand here in Newark because of the varied ethnic groups that call it home. No matter the accent, (which I always find endearing) a Speech Coach can help your delivery. The Prudential Center, located in the central business district of Newark hosts about 200 high profile events per year. It is the home of the New Jersey Devils and the Seton Hall Pirates. The center is also a venue for concerts, with many A-listers including Paul McCartney, Kendrick Lamar, and Lionel Ritchie. 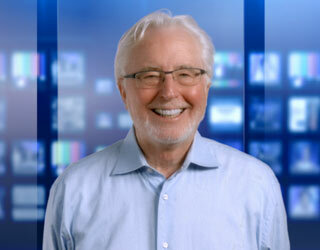 We have been able to supply prompter solutions for events at this venue.